When the United States announced its independence from Great Britain in 1776, the Principality of Monaco was a sovereign independent country benefitting from the military protection of the King of France, Louis XVI. Monaco and the United States exchanged their first consular agents very early on in the years following the U.S. Civil War. Since then, the two countries have had overlapping ties, strengthened early-on by Prince Albert I of Monaco who travelled the United States three times between 1868 and 1921. During World War I, the principality hosted American soldiers. The marriage of Philadelphia native Grace Kelly to Monaco’s Prince Rainier III in 1956 further cemented the bond between Monaco and the United States. Monaco joined the United Nations in 1993 and the Council of Europe in October 2004. In 2005 France and Monaco renegotiated the 1918 Franco-Monegasque Treaty. Under the new provisions, which reaffirmed the independence and sovereignty of Monaco, full direct diplomatic relations between Monaco and other countries have occurred and Monaco began to receive foreign Ambassadors. It was in the years following the U.S. Civil War that the United States and Monaco, both established states, began commercial relations. Although the Prince of Monaco appointed Louis Borg to serve as his Consul to the United States in New York on May 19, 1865, nearly another year passed before Borg was able to present his official credentials to the United States Government. Borg, already serving in New York as the Chancellor of the French Consulate, had to obtain special authority from the Emperor of the French, Napoleon III, to be able to also hold the post of Monégasque Consul. This dispensation was granted and in May 1866 Borg was fully accredited by the United States as Consul for the Principality of Monaco. The late-1860s was an era of increased tourism for Monaco due to the construction of railways that provided greater access to the Principality, as well as the establishment of the Casino in Monte Carlo. Consequently, the United States appointed its first consular representative to Monaco, Emile de Loth, on January 30, 1874, as Consular Agent. De Loth was accredited by the Prince of Monaco on February 22, 1874. This post was ordered closed on February 16, 1906 and moved to Nice. The United States and Monaco established full diplomatic relations on December 8, 2006, when the first Monegasque Ambassador to the United States, Gilles Noghès, presented his letters of credence to President George W. Bush. U.S. Ambassador to Monaco Craig Stapleton presented his credentials to Prince Albert II on December 13, 2006. Stapleton was resident in Paris. 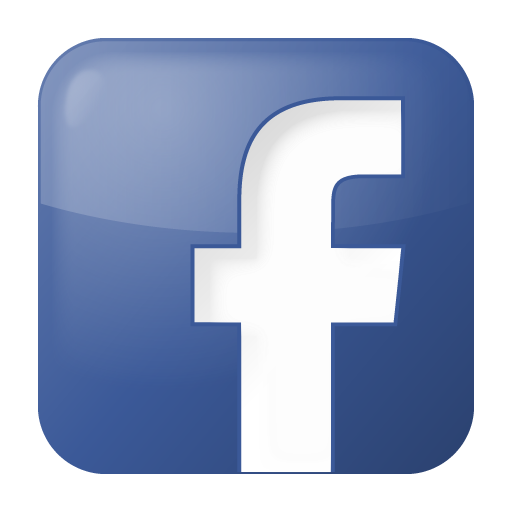 On June 1, 2009, U.S. President Barack Obama appointed Charles H. Rivkin of California to be U.S. Ambassador to France and to Monaco. Ambassador Rivkin was sworn in on August 3, 2009, in Washington, D.C. The Official Announcement of H.E. Stapleton's nomination can be downloaded here in French or an unofficial translation in English. 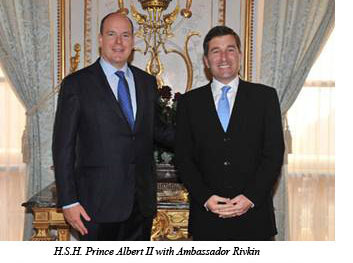 On October 29, 2009, Ambassador Charles Rivkin presented his credentials to Prince Albert II of Monaco and was officially welcomed by the Prince as the U.S. Ambassador to Monaco. Ambassador Rivkin is the second U.S. Ambassador to be accredited to the Principality of Monaco. During his meeting with the Prince, Ambassador Rivkin congratulated Him on His recent acceptance of the Teddy Roosevelt Medal, presented by the U.S. Congress in acknowledgement of the Prince’s outstanding contribution towards environmental protection. On February 15, 1939, a treaty of extradition was signed between the United States and the Principality of Monaco. This treaty was ratified on August 30, 1939. An agreement on passport visas for United States and Monégasque citizens entered into force on March 31, 1952. On October 20, 1913, Prince Albert I of Monaco was received at the White House by U.S. President Woodrow Wilson. 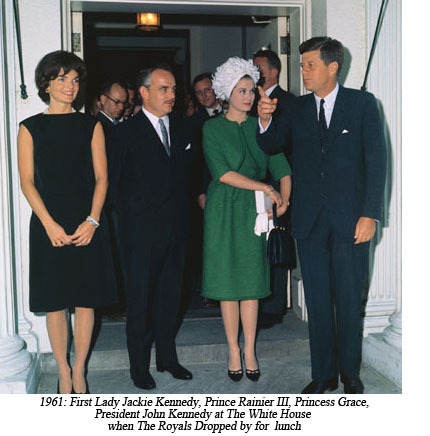 This was Prince Albert I's second trip to the United States. This trip included visits to the Midwest and Western states, where he met with Colonel William Frederick Cody, commonly known as "Buffalo Bill." On April 23, 1921, Prince Albert I of Monaco came for the last time in Washington. After visiting the Smithsonian Museum, He delivered a speech: “the Discours on the Ocean” at the National Academy of Sciences. He made an official visit to President Warren G. Harding at the White House. From 1977 to 1981: Hereditary Prince Albert II studied at Amherst College, Massachusetts, U.S.A. The Prince studied political science economics, psychology, English literature, anthropology, geology, philosophy, sociology, German and music. 1984: First Award ceremony of the Princess Grace Foundation U.S.A. in Washington, D.C.
President and Mrs. Ronald Reagan attended the ceremony in 1984 when the first grants from the foundation were awarded during a weekend filled with events in Washington, D.C., including a reception at the White House. The same celebratory tradition has continued every year, with new recipients being honored at a gala in New York City. 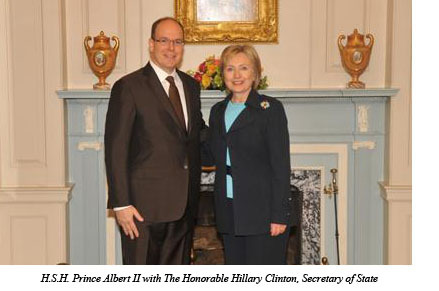 September 26, 2007: Opening of the Embassy of Monaco in Washington D.C.
On this occasion He met The Honorable Hillary Clinton, Secretary of State. On October, 20, He received the “Theodore Roosevelt” award in Washington, D.C.
On October, 23, He received the “Roger Revelle” prize at the University of San Diego, California.